You've been up most of the night working on a book report for a school assignment. After a few hours of sleep you get up, turn on your computer, and find a message from the author of the book you reviewed, thanking you for what you wrote. What??? Is this some kind of sleep-deprivation and caffeine induced delusion?? In the past it would have been, but not any more. "I am Chris Locke, one of the authors of the Cluetrain Manifesto. David Weinberger alerted me and the other co-authors to your post, which is a wonderful essay of the state of affairs today. I don't think any of us really believed in 1999 that business would evolve across the board and fully rise to the opportunity the web offered. We did hope (in simplistic terms perhaps) to shame the Bad Guys and encourage the Good Guys -- both of which camps are still well represented out there. Your example of how individuals can and do make a difference is inspiring. Thanks for writing this." Wow! Nothing like this has ever happened to me before. When you write a book report for school, you just don't expect to get a thank you note from the author the next morning. And Chris Locke isn't just some blogger; the Financial Times of London listed him as one of the "top 50 business thinkers in the world" in 2001. Later in the day I had a meeting with my teacher Kathy and asked her if she had forwarded my blog post to the authors. I thought perhaps they were friends of hers. She said no and explained to me about specialized search tools that authors can use to alert them anytime anyone posts anything about their work on the Internet. By commenting on my humble little blog post, Chris Locke demonstated exactly what he and the other authors of "Cluetrain" are talking about. The world really is becoming a networked community and has the potential to become a more humanized place becaue of it. Thanks to the Internet, an author can rise up from the black and white of his text, materialize as a real human being to one of his readers and interact with the reader's thoughts about his book. Oh brave new world, indeed! One evening recently I was standing in line at my local convenience store and overheard a conversation between the female clerk and a young man who had several shirts in a dry cleaner’s bag draped over his arm. He apologized for the shirts as he juggled them to dig for his wallet and remarked, “I never used to have anything dry cleaned until I got a real job.” The clerk and I shared a laugh after he had left and agreed that we somewhat resented his phrase “real job.” She told me that she loves her job and considers it as real as any other. We both knew what he meant by a “real job.” A “real job” means working in an office, doing things that are often boring and stressful but are generally considered to be somehow vital to our society and our economy; it means sweating under pressure in a starched shirt, but with the satisfaction of knowing that you are on a real career path, betting on the Main Chance, following The Money and getting in on the the Real Action. 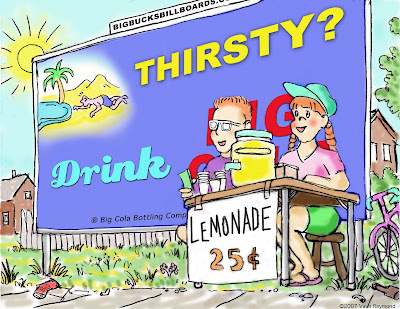 The two kids in my cartoon will eventually abandon their piratical lemonade stand and may get “real” jobs some day - maybe even work for BigCola.com or BigBucksBillboards.com. A “real job” means working for THE MAN, the Establishment, for the kind of organizations that the authors of “The Cluetrain Manifesto” predicted in 1999 would soon become dinosaurs. In 1999 David Weinberger, Doc Searls and Chris Locke created a “Cluetrain” website and book in which they heralded “the end of business as usual,” due to the arrival of what they call “networked markets.” Thanks to the spread of the Internet, and the development of intranets within big companies, they believed that businesses could no longer control markets, nor their own employees, and therefore could not continue doing business as they always had. The ability of people to communicate instantly, find information on virtually anything and find each other through the Web had broken down the barriers that businesses have traditionally erected around themselves. I have seldom read anything as funny or as true about business as the authors’ searing observations of the traditional culture of “real jobs.” They compare corporations to medieval castles, surrounded by moats of secrecy, ruled over by absolute monarchs and favored courtiers. The primary force, they write, by which companies strive to motivate employees and structure their organizations, is fear. They point out that corporations create elaborate security networks to protect themselves not so much from their competitors as from their own customers and their employees: to make sure that no one but their inner circle really knows what it going on. They observe that corporations consistently avoid any kind of real dialogue with customers or employees, but instead issue propaganda that few people in or out of a company fully trust or take seriously. Observations like these echoed my own experiences of corporate cultures and the two worlds I have found there: the official world of corporate propaganda and the actual world of day-to-day work in the trenches. Another day at this same company the whole staff was called into an all-day meeting, complete with a big lunch and fancy snacks, during which a representative from our new health insurance provider explained, at great length and with many glossy handouts, all the wonderful benefits of our new health insurance plan. As the hours dragged on, we began to wonder, why all this fuss? Then, late in the afternoon, the truth finally came out. “Now, I think you’ll all agree," said the general manager, “that these benefits the company is giving us are wonderful and that we need to do our part too.” Then the hammer came down as he explained how each of us would begin paying for this new health plan with big deductions from our paychecks. They had fattened us up and lulled us with happy talk all day so they could tell us that the company wouldn’t be providing us with health insurance any more. We had to buy our own. I remember reading annual reports from a company in which I owned some stock. Year after year there were glowing reports about how they were growing and expanding into new facilities and new markets. Then one year they reported with equally glowing words, about how excited they were to be “streamlining” their operation by “downsizing” their staff, selling off excess facilities and “focusing on a more select section of the market.” They were sinking like the Titanic but their brass band was playing a rousing march. I could go on and on. We have all had experiences like these that have made us grow somewhat cynical over the years about the business world. The authors of “Cluetrain” believed in 1999 that our cynicism was cresting, both as customers and as employees, thanks to our new ability to communicate with each other through the Internet and see the waves of B.S. that the business world is constantly rolling our way. 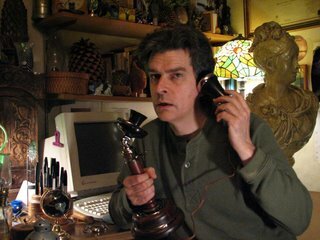 In a chapter called “Internet Apocylpso,” Christopher Locke tells the story of how little, isolated cells of techies began communicating with each other in the early 1990s and how they developed an iconoclastic, no-holds-barred style of communication that frequently punctured the overblown images of the organizations for which they worked. At first, he writes, the Internet was so small and specialized that no one in power took it seriously. By the time organizations realized how big the Internet community was growing and where it was heading, it was too late to control it or stop its freewheeling spirit. By 1999, the authors believed that organizations needed to either adapt themselves to a new spirit of realism, honesty and open communication or else go out of business. So here we are now, eight years later. Have the predictions of the authors of “Cluetrain” come to pass? Has the spirit of the Internet community ushered in a new age in business? To some extent, yes. As in all revolutions, however, many people have simply put a new cockade in their hat and have kept their old ways. Also, as in George Orwell’s “Animal Farm,” many of the new bosses are acting more and more like the old bosses all the time. Businesses are also communicating differently. On its website, aTeK probably describes its services as “cool features” and “killer aps.” At meetings executives call each other “dude.” Customers can now “access” the company “24/7” through its website. Of course most of this is just window dressing. Many companies are simply using new technologies and new communication styles to keep on shoveling the same B.S. they have always shoveled. Some of them are using the Internet to shovel EVEN MORE B.S. than they did before, thanks to the ability to send Spam infinitely and spread rumors anonymously on the Web. Some organizations are using their websites to retreat even further from the public than they did before. Want to learn more about aTeK? Just click on this link. Want to get in touch with us? Just email us and our computers will analyze your inquiry and send you an automated, personalized response instantly. No, you won’t find our address on the website. You don’t need it. We are everywhere and nowhere. Want to call us? Here’s an 800 number you can call to get recorded information. Want to talk to a human being? No problem. Just type in your credit card number and we will set up a customer service account for you. 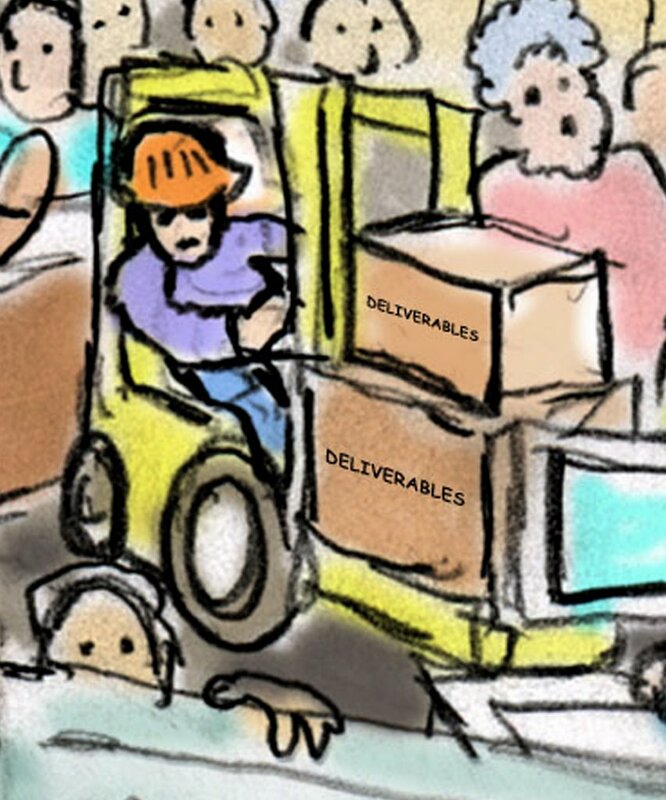 Real changes are happening, of course, due to new technology, globalization, outsourcing and, yes, to the new spirit of business the authors of “Cluetrain” describe, and many of these changes are good! I think it is important, however, for everyone involved in e-commerce and digitized organizations to take a good look at the Internet’s potential to improve their relationship with the public, instead of just its potential to make life easier or more profitable for themselves. Everyone should read “The Cluetrain Manifesto” to catch the Utopian spirit its authors felt at the dawn of the Internet age. We need to keep this spirit alive. There is hope that we can. A couple of years ago we got a new department manager at the hotel restaurant where I now work. He came from a background in human resources and one of his first acts was to call a meeting for the whole staff at which he presented, with great passion and with many Powerpoint slides, our parent corporation’s Mission Statement. When he was done he asked us how we felt about it. For thirty seconds thirty faces stared blankly at him. Finally, a little reluctantly, I raised my hand and commented that it sounded pretty much like the Mission Statement of every other company for which I have worked. What we really needed to talk about, I suggested, was our own individual mission as a restaurant and our specific goals, strengths and weaknesses, rather than the generic philosophies of the corporation. The new manager turned a bit red and began stammering, but the staff breathed a sigh of relief and a lively discussion of real issues ensued. Later I heard through the grapevine that after the meeting the new manager was asking people, “Who was that incredibly RUDE guy?” In the following months, however, he and I became good friends and conspired together to make some real waves around the organization. On the day he left for another job at a bigger company, he hung up a beautifully printed, laminated poster on the back room wall. It was a brand new Mission Statement for our restaurant, which he had written himself, that really talked about who we are and where he saw us heading. He had gotten my message. In little ways, here and there, the gaps between “real jobs,” real people and the real world may be closing. Kathy told a significant story in class tonight. She was working on a project for a company where deadlines were so rigid and unrealistic that, in order to keep on schedule, she had to train customer service people to troubleshoot a product that didn’t even exist yet. On the final day of the schedule, “delivery” was achieved by sending a rough version of the product from one office of the company to another. Thanks to this “successful delivery” on the target date, some vice president was able to get his bonus, even though the actual product was not ready until many months later. This story is a great example of the cultural phenomenon I raised: our obsession with setting and meeting ambitious goals and timetables. Of course goals and schedules are important, but not when they are unrealistic, arbitrary or designed mostly to make some manager look good or as a marketing strategy to win a contract. As Magnus ironically commented, projects today are budgeted with the idea that they will go over budget. In “Notes on Design Practice” Thomas Erickson reveals an interesting trick of the trade among art directors and designers. Having created a fairly finished design on a computer, the designer places a sheet of paper over the screen and traces the design by hand for presentations. This creates the impression that the design is more preliminary and more open to suggestions and changes than it actually is. Erickson also lists “roughness” as one of the important characteristics for prototypes. Roughness helps to present an idea in progress, without a flavor of finality. I got thinking about these two concepts while I was creating this week’s cartoon, which is both rough and hand-drawn. In a cartoon, I realized, the most important thing is the idea, not the drawing itself. Maybe this is why most cartoons are drawn rather simply, providing just enough information to get the idea across, without a lot of fussy details that might distract from the idea. So perhaps a prototype is a sort of cartoon for an idea of a final product. There is also an appealing quality to things that show the mark of a human hand. Perfect renderings prepared with mathematical precision on a computer have an initial appeal, but this fades quickly, leaving a feeling of coldness and lack of heart in its wake. Although recent generations have grown up learning to love the smooth, spotless look of molded plastic and the “new car smell” of petroleum by-products, I doubt that we will ever entirely lose our instinctive attraction to hand-made things and natural products. As I ride the bus through the endlessly repeating landscape of malls and chain stores that surround Seattle (like one of those looped backgrounds behind the Flintstones as they drive), I often ask myself one question. Why is it that we, the richest, most productive society on earth - who can design and produce almost anything we want in any shape we want – do not surround ourselves with incredible beauty? I am always looking around for things worth drawing or photographing, for things and places that are literally “picturesque.” Sometimes I find a lot of them in the same place. But more often I go for miles and miles without seeing any. I have noticed some patterns. For example, I find that very rich and very poor neighborhoods tend to be the most picturesque. Nature, untouched by humans, is usually beautiful, but there is also great beauty to be found in the most un-natural of environments: in factories and industrial districts where aesthetics have no value. These two words answered a lot of my questions. In factories, there is beauty in raw, naked PURPOSE in action. In the poorest of slum neighborhoods in Third World countries, one can sense the PURPOSEFUL way people survive as best they can, and the PASSION with which they make and adorn their houses with whatever resources they can find. In the richest of neighborhoods and resorts, the PASSION of connoisseurs and the artists they can afford to hire dazzles the senses. By contrast, in the vast aesthetic wastelands of American suburbs and malls, passion and purpose are either lacking or diluted. Everything here is designed by committees, and ideas go from research teams to design teams to engineering teams to corporate oversight teams and so on, as Erickson and others describe. In such a process, how can even the most brilliant of ideas not get compromised? 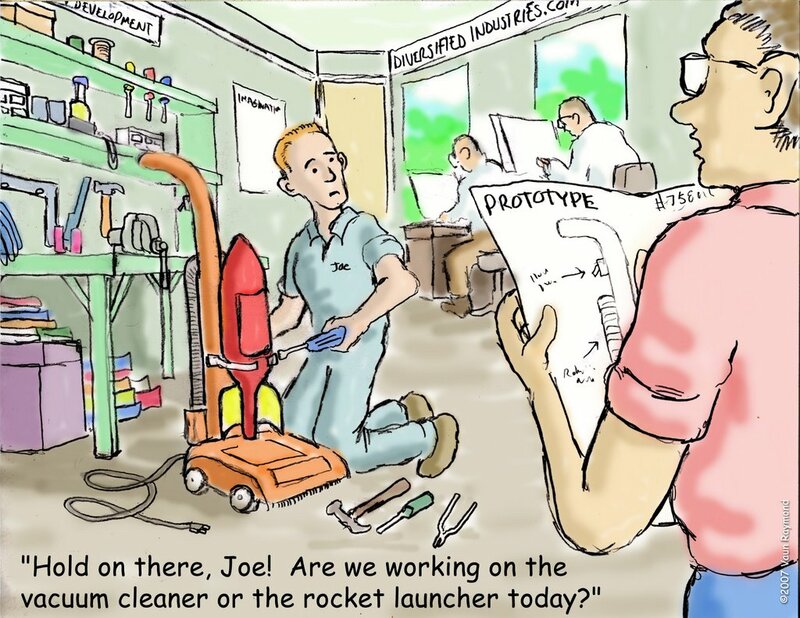 Often simple, elegant ideas get overcomplicated, as more and more people add their input, and we may end up with vacuum cleaners equipped with rocket launchers. Frequently we end up with compromises between aesthetics and functionality, with end products that are neither fully passionate nor fully purposeful. Hence their lack of beauty, as well as practicality. We end up surrounded with products and environments that are at best approximations of quality and beauty - at worst caricatures of them. When I was a kid I used to watch television on Saturday mornings, and in between the cartoons there were ads for toys in which cartoon-like plastic people were shown driving cartoon-like plastic cars and living in cartoon-like plastic houses. Today I feel like this cartoon world has grown to full size: we are all Barbies and Kens and GI Joes living in a cartoon world made by Disney, Mattel and Hasbro. So it is no wonder that smart designers trace plans off computers to present them in hand-drawn diagrams that bring back a sense of passion and raw purpose to their presentations. In doing this, however, they are merely creating an illusion. In order to achieve truly great design, in order to achieve the full potential of the power we have to shape our world, we need to bring passion and purpose back to the way we design and build things from start to finish. We need to give more power to individual designers and inventors, break down the walls between designers, engineers and business people, and reduce the distance between ideas and final products. We also have to reduce the distance between people and the work they do, give them a stronger stake in it and a greater sense of ownership. We should also return to some old fashioned ideas of craftsmanship, artistry and ethics. Above all we have to learn that we cannot get away with cheating. Yes, we can make things that look okay and work okay and people will buy them. But people can tell the difference between things that are okay and things that are great. Even if people don’t know they can tell the difference, they sense it sub-consciously, in their bones. The quality of the things we make and the environments we create really does effect people's sense of values and the level to which they aspire to greatness in their lives. Tonight’s assignment is to describe what I would do if I were made project manager of a website development team whose members are geographically scattered. I guess the first thing I would do is get on the telephone and introduce myself to any team members I do not know already. There is certainly nothing better than a good old-fashioned conversation to establish a relationship with someone. Perhaps I would ask all team members to contact each other by telephone to introduce themselves. From then on most communication would be by email. How would I help develop team spirit? Perhaps one way would be to establish a team wiki or ask team members to keep a weblog, as we do in this class. This would provide me with informal progress reports and would allow other team members to see how their associates are doing and get a sense of how the team is doing as a whole. I would also keep a weblog in which I would post an overall progress report, highlights from team members’ weblogs (just as our teacher Kathy does) and my reactions to them. I would encourage team members to post any relevant pictures to their weblogs, including preliminary designs, pictures of themselves tearing their hair out, etc. In a virtual team, as opposed to an actual team, communication is a little slower and a little more awkward, of course, but I think there are actually some advantages. 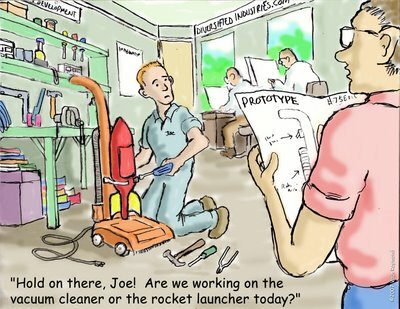 Working with teams in the past I have found that a lot of time gets wasted with small talk, jokes and half-baked ideas. I think that the effort and concentration required to sit down and compose an email might filter out some of this noise and force team members to think more carefully about what they are communicating. Of course the best teamwork comes from people who keep the group’s goals as well as their own jobs in mind at all times. Therefore, I think that this group wiki or blogging arrangement would work well to create a kind of public sphere in which team members could see the their own work alongside that of the rest of the team. 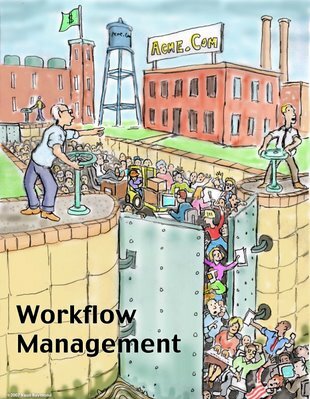 As far as “workflow,” I have never experienced it. I’ve worked; I’ve followed procedures; I’ve made progress and I’ve completed tasks, but I don’t think I have ever flowed. 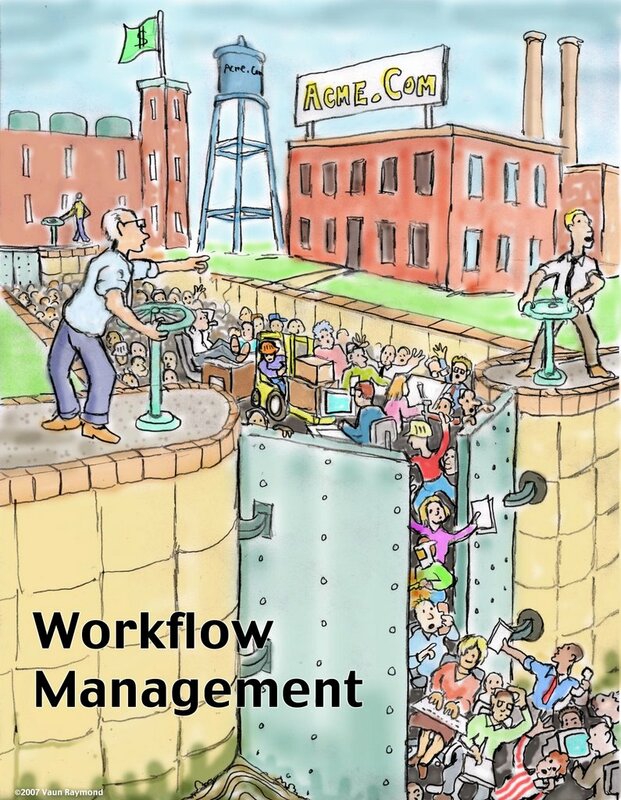 I drew the cartoon above to show my impression of what “workflow management” might look like. In Shelford and Remillard’s chapter on “Web Team Roles,” I was struck by how many different jobs there are on a web development team. Developing a complex website for a big organization must be somewhat like producing a motion picture, where there are also many jobs with a lot of overlapping functions and fine distinctions between similar roles. What Shelford and Remillard call a Project Stakeholder is what people in the film industry call the Executive Producer: the money guy or the studio boss. A web team’s Project Manager and Producer are comparable to a film’s Producer and Director, respectively, who do a kind of dance together as they balance the logistical and creative decisions of a project. The complexity of relationships on a web development team, with all the possibilities for conflict and office politics, reminded me of why I got into documentary-style filmmaking, where I could work pretty much alone. I hope that similar opportunities for loners exist in small-scale Web design. Actually, I have been extraordinarily lucky in the clients I have had over the years – maybe because I haven’t really had all that many. Most of them have been very cooperative and down-to-earth and have given me a lot of creative freedom. For the last five years I have had the absolute dream client. Each year around May she calls me up with the names and phone numbers of two people about whom she wants me to produce video biographies. Long ago we agreed on basic procedures and prices, so now we don’t bother with contracts, proposals, progress reports or any of that stuff. Off I go, traveling around and doing my work, seldom speaking to my client until I send her two finished products in early September. Occasionally she will need a tiny tweak, but usually she just emails me, “looks great; send me your bill,” and that’s it. Some years we don’t even see each other at all until the big charity ball in October where the videos are screened. Doing business is seldom as simple or as sweet at that. I gulped when I read about the client surveys and audience research Goto and Cotler advise website developers to do. At first I was skeptical about the need for gathering all that background information, thinking it was just a way to justify more “billable time.” Then I turned the page and read about the ramifications of different browsers, screen sizes, computing speeds, bandwidths and so on. I thought we had it bad in the video world, where our biggest worry is what kind of video monitors our viewers have, and whether their brightness, contrast and color balance will be adjusted correctly. The possibilities of a website designer’s work getting “lost in translation” seem so much greater. So much to do before we even begin talking about design! So much before we even start thinking about all the technical challenges that lie ahead! The little stack of unopened Dreamweaver software and tutorials beside my computer is starting to cast a long and ominous shadow across the room. I am a student in the Master of Communication in Digital Media program at the University of Washington. 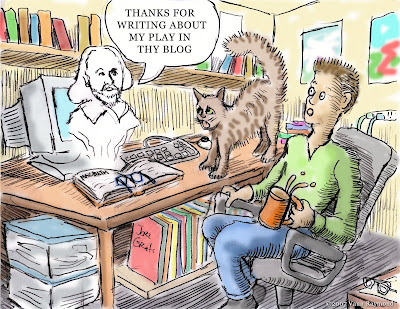 Postings to this weblog are my comments on assigned readings and classroom discussions. I have never been a cartoonist, but the ability to post images here inspired me to pick up an old graphite pencil that was sitting on my desk and start poking a little fun at the Internet, high tech and corporate culture. Now fellow students tell me they eagerly wait for Mondays so they can see my latest cartoon! Cartoons on this site are licensed under a Creative Commons Attribution-Noncommercial-Share Alike 2.5 License.